Villages across the Vale of Belvoir are getting much better prepared for life-saving thanks to grant from Leicestershire County Council last year. 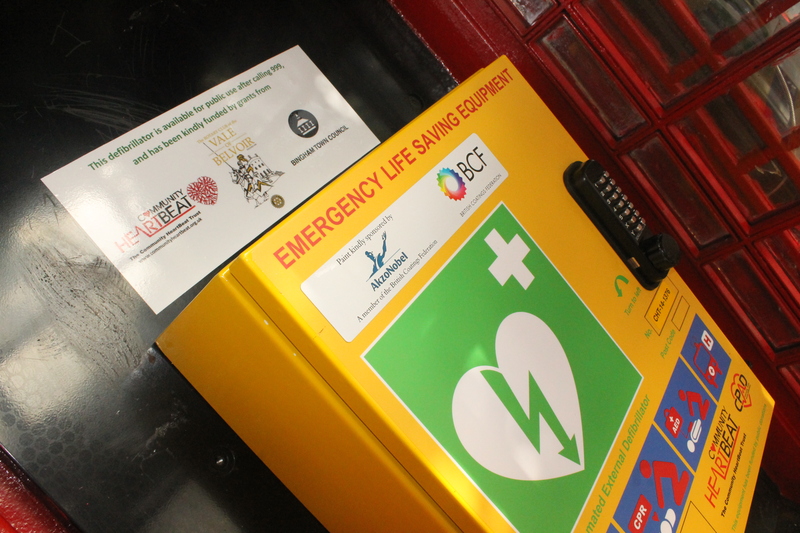 The local brack of the Community Heartbeat Trust, the national charity dedicated to the provision of community based defibrillation and training have used the award as match-funding to roll out the provision of defibrillators throughout the Vale of Belvoir. Local people were concerned that distance from hospitals was a major risk in the likelihood of heart attack victims surviving a sudden cardiac arrest. Working in partnership with parish councils and/or community groups such as Lions, they identified 8 locations where the community accessible defibrillators would give most value - including the first to be delivered at Wymondham, a village remote from other forms of medical cover. Secretary of the group, Martin Fagan, thanked the BElvoir Community Forum who decided how to use the money. "Parish Councils and other loacal organisations understand how crucial it is to get an immediate response when someone is having a cardaiac arrest" said Martin. "They will help to publicise the locations of the defibrillators and encourage local people to learn how easy they are to use" Martin continued "Around the country many villages are installing community based defibrillation, in partnership with their local ambulance service and organisations such as ours." "It's a fact that the provisions of early defibrillation, while an ambulance in en-route to the scene of a cardiac arrest, has the potential to save many lives. That's why the availability of defibrillators in rural communities is a great advantage for local residents, as well as anyone else who suffers a heart attack while in the vicinity" said Andy Moss of East Midlands Ambulance Service "EMAS fully supports community based defibrillators and agrees that they help save lives." Chairman of the LCC Community Forum Peter Holbrook said, "when sending an ambulance in response to a 999 call, East Midlands Ambulance Service will also advise the caller of the location of the Community Heartbeat defibrillator if one is available in their Parish. The avilability of a defibrillator with the added link with EMAS could be a real and positive help to save a life in the event of a heart attack." County Councillor Bryon Rhodes, who is also vice chair of the Community Forum, added, "I am looking forward to hearing which other villages will benefit from the scheme" he said. "They really could be the difference between life and death for a resident of the Vale and Wolds villages."